Although not much progress has been made in Russian-EU relations in recent years, President Vladimir Putin’s decision to make Berlin and Paris among his first destinations abroad speaks volumes about where his foreign policy focus lies. From the Russia-EU summit in St. Petersburg, held on June 3-4, as indeed from other Russia-EU summits, we didn’t expect any kind of breakthroughs. The movement on a new treaty between Moscow and Brussels reached an impasse long ago. During the years it was discussed, a variety of approaches to the document and to its essence emerged. In the meantime, Europe has gradually sunk into its own problems, and is now not up for constructive negotiations with Russia. And so, the summit between Russia and the EU confirmed once again the mutual desire for cooperation between the two parties. As during previous visits to Europe, President Vladimir Putin reasserted the mutual benefit of initiatives put forward within the framework of a comprehensive cooperation program with the European Union known as the “Union of Europe.” This program intends to create a single economic space, form a common humanitarian space, introduce a visa-free regime, and, finally, promote a united energy and transport space. Vladimir Putin’s first visits abroad in his new presidential term were, after Belarus, to France and Germany. Of course, these countries remain Russia’s key partners. Russia’s third important partner in Europe is Italy, but it is in a difficult economic position and not up to negotiating with international partners at the moment. Europe as a whole, unfortunately, is currently not a capable partner. It will have to go through a whole series of internal transformations before it can again become an effective partner for Russia. At the same time, Moscow isn’t closing the door on contact and dialogue on any of the issues of interest to both parties. Moreover, Russia has agreed to coordinate some foreign policy moves with Europe, such as finding a suitable resolution to the situation in Transnistria. But this step forward by Moscow was not followed by any actions on the part of the European Union. Russia is cooperating with leading European countries as needed, especially since in the future the EU countries may prefer to negotiate on a bilateral basis rather than within the EU framework. Although it seems that the opportunity to overcome the crisis in Europe with minimal losses is gone, there is still hope that the EU will retain basic structural components: a single market, visa space and the Euro. Whatever happens, during visits to Berlin and Paris and during the Russia-EU summit, President Putin confirmed Russia’s readiness to cooperate first and foremost with Europe’s leading economies. Following Germany and France, priority will presumably be given to Scandinavian countries—the EU members that are overcoming the crisis most easily. They have been able to conduct structural reforms needed to improve competitiveness in the world in time. There is no doubt that in coming years Russia will make special efforts to develop the Eastern area of its policy. However, this development does not mean that the “Union of Europe” is fading into the background. The project remains on the agenda. But when Putin first put forward far-reaching plans regarding the EU in 2001, Europe did not take them up. The process of rapprochement between the EU and Russia has been extremely slow, and quite often zero sum games have prevailed. Be that as it may, Russia is in need of a strong European partner culturally, historically, and socially. The stronger Europe and the Russia-European connection is, the better for Russia and for global geopolitical competition. But Russia is forced to reckon with the realities, and they look like this: Europe is weakening rapidly, even in comparison to its state in past decades. It began to weaken due to a number of circumstances, among them the hasty decision in the early 1990s on the movement toward a single foreign policy. This idea has degenerated into the construction of a kind of policy that is based on the “lowest common denominator.” As result, the great European powers, primarily Britain, France, and Germany, are increasingly taking matters into their own hands. The fact that Putin made this particular trip to Europe soon after his inauguration is a very positive signal. The Russian president could have immediately gone to the East, but Putin confirmed that Russia stands with Europe. 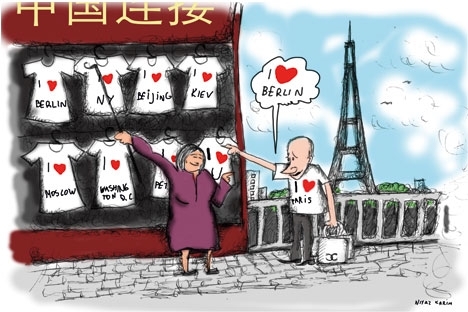 While China and the United States are certainly, in terms of geopolitics, important players, Putin showed where he stood by going first to Berlin and Paris, not Washington or Beijing. Sergei Karaganov is a Russian political scientist who heads the Council for Foreign and Defense Policy, a security analytical institution founded by Vitaly Shlykov. Karaganov is a close associate of Yevgeny Primakov, and has been Presidential Advisor to both Boris Yeltsin and Vladimir Putin. As told to Yevgeny Shestakov.